are strong and your gums kept in good health. This in turn benefits your general health and your confidence. In a caring and personal environment the team at Northlight help to create and maintain your perfect smile. Through my clinical work in both private and NHS practices I have gained experience in the treatment of complex periodontal conditions. I received my Diploma in Dental Hygiene at Guys Hospital in London and then my BS in Dental Hygiene at the University Of Colorado USA. I later went on to graduate with Med through Boston University. My passion is to show you how a simple dental health plan along with my clinical skills can help to transform your gum health. I have travelled in India and Africa and lived in the US and Belgium for a number of years. I grew up in India! I have an ongoing interest in using my professional skills and travel experience to meet the needs of disadvantaged communities across the world and regularly travel with dental teams overseas. Last year it was trekking the Himalaya’s to remote villages, and this year I will be in Sri Lanka where as a team we will provide basic pain relief, dental health education and prevention. I have a busy family life with 3 grown sons moving their way into, through and beyond university into the working world. My interests include swimming, trekking, travel, culture, language and cooking and eating Indian food! This entry was posted in Blog, Gum Disease, Hygienist, The Team on 2nd May, 2018 by Northlight Dental. 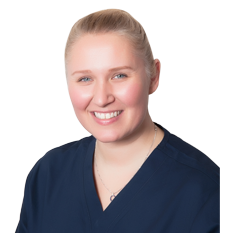 Hi, I am Isla and I have been working as a dental hygienist with the Northlight team since October 2016. I live in Northamptonshire with my husband and two children, who keep me very busy! I enjoy coming to work as not only do I love my role in helping people improve their dental health BUT it is a break from the madhouse that is my home!! I started my dental career working as a dental nurse for the British Army whilst living in Germany. When I moved back to England I took a position working with the British Dental Health Foundation charity, manning a dental help line answering all sorts of dental enquiries. I was also working with a team who were responsible for creating and updating the BDHF “tell me about” patient information leaflets, making dental ‘jargon’ easier for people to understand. Through my experience with the BDHF it became clear there was a real need for people to understand their treatment needs and options using language that is easily understood, thus ensuring they could make a true informed decision. As much as I loved my time at the BDHF I missed working in a clinical setting and returned to dentistry after qualifying as a dental hygienist in 2004. Within my first week I must have heard the expression,” I hate the dentist” at least 10 times and I had never even met the patient before. This really bothered me! I want people to leave my sessions feeling positive, in control and that it has been worth their time. Certainly NOT fear or dread coming back. I want patients to feel that they could ask me anything, to feel that they are treated as an equal and not just a mouth! I like to keep my sessions very informal. I encourage conversation to make patients feel at ease to help lessen any anxiety. I want patients to feel that they can ask me anything, to feel that they are treated as an equal and not just a mouth! I always try to explain what I am doing, why I feel it is necessary and the possible outcomes, so that my patients come away feeling that they have been given the information that they need, and that they feel the treatment brings value to their health. This entry was posted in Blog, Gum Disease, Hygienist, The Team and tagged hygienist, Isal Baxter, Northlight Dental on 4th April, 2018 by Northlight Dental. I started working at Northlight Dental in November 2017. After a long career as a dancer and personal trainer I decided it was time to find a stable role within a company who strives to help people. And after travelling around the world and working with different people from various walks of life I came to realise where my real passion was, and that was to meet new people and help them in whichever way I could. 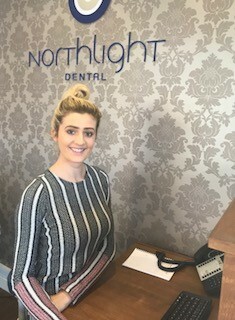 Since starting at Northlight Dental I have thoroughly enjoyed meeting all of our patients and assisting them however I can, whether it be simply booking an appointment or being a sense of reassurance that they are in the best hands. Whilst I was applying for roles the main thing I was looking for was a family environment with a close hard working team, which I am pleased to say I have most definitely found. Starting the ‘Front of House’ role at Northlight has been nothing but positive, I would be lying if I said I wasn’t nervous to learn the way the company system works and how to correctly keep the reception organised, I have found it challenging but at the same time very rewarding. I have been lucky to enough to receive wonderful training including an external training day where I have been taught how to calmly and correctly approach the role. I have now found myself working in a business that has an incredible vision to create the best experience for people seeking dental work which I am thoroughly enjoying. I am excited for my future at Northlight Dental and want to thank the team for being so welcoming. 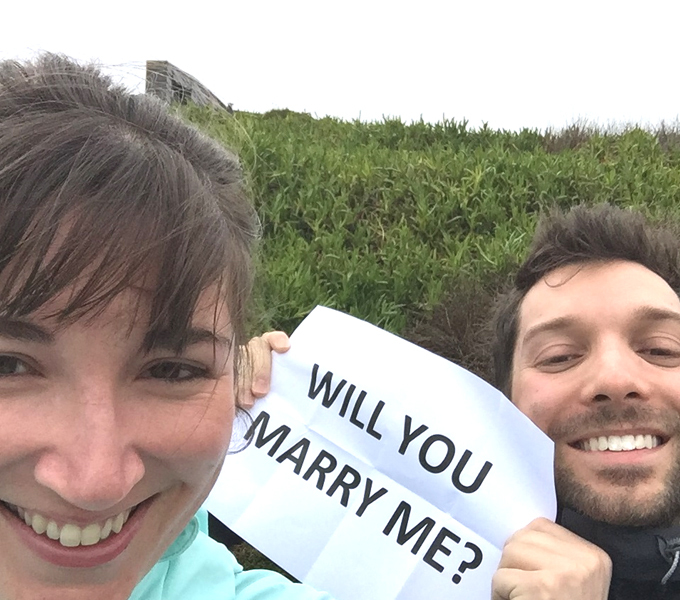 This entry was posted in Blog, Nervous Patients, The Team on 15th February, 2018 by Northlight Dental. “I was definitely aware that the majority of my teeth were not aligned correctly, especially the two front upper incisors which were seen every time I smiled, and a misaligned lower incisor which had been muscled out of the way by the rest. The lowers especially were a chore for me to clean properly. I had come to realise the power of straight healthy teeth and a confident smile. From friends and family, to colleagues that I work with every day, to meeting new people, people subconsciously warm to a confident smile, I do it myself !! From the first consultation Neha explained the stages of the treatment clearly and concisely and was more than willing to elaborate if I had any more detailed queries. Before each appointment I was fully aware of what the plan was and what result she was going to achieve. You can physically see and feel your teeth being corrected throughout the stages of treatment. Neha was acutely aware of me as the patient ensuring that I was comfortable and relaxed at all times, which I always was. You get the genuine feeling that Neha and her professional and friendly colleagues care about the condition of your teeth as much as you do and the end result more than shows that. Once I had the braces fitted, for the first few days I did wonder if I had done the right thing, there’s no getting away from that. However, after a few days I started to forget they were there, and I never looked back. In terms of other people noticing, the only alien feeling came from myself being conscious of them. People usually notice the thin wire first and then realise you have braces, but the white brackets are a brilliant thing and the clear silicone bands that Northlight use add another dimension of camouflage. It’s amazing how many previous brace wearers come out of the woodwork and talk to you about their experience and since I have had mine removed, I have struck up conversations with people with them and assured them that they will be so happy with the final result. This entry was posted in Blog on 20th January, 2017 by Northlight Dental. Dental implants are a thoroughly modern way to replace missing teeth. At Norghlight Dental in Milton Keynes, our skilled implant dentist Dr Sunil Passan can replace one, some or even all of your natural teeth with implants. Treatment with dental implants involves a dentist placing one or more small titanium screws in your jaw bone. This involves a minor surgical procedure, which is carried out here at our Milton Keynes dental practice under local anaesthesia or sedation, depending on your preference. These titanium implants replace the root part of a missing tooth or teeth. Crowns, bridges or dentures can then be attached on top. Implants are the only permanent way to replace missing teeth. With proper care and regular visits to your dentist and hygienist, they can last you many years – in some cases even a lifetime. As well as being permanent tooth replacements, implants have many other benefits over traditional alternatives, such as unsecured dentures. To find out more about what implants can do for you, book a no-obligation consultation at our Milton Keynes dental practice. 1. They look and act like natural teeth. You will have a smile that you’ll be keen to show off, and the ability to bite and chew food with confidence, enjoying a healthy, balanced diet once more. 2. 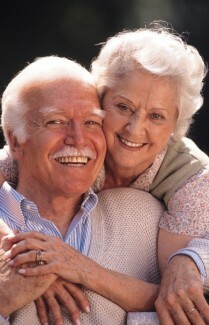 Unlike traditional dentures, restorations attached to dental implants will not become loose and uncomfortable over time. They will stay firmly in place, avoiding the potential embarrassment of loose dentures falling out. 3. Dental implants help to support bone growth, and prevent bone loss. This can help you keep a more youthful appearance for longer. 4. Implants are an investment in your future. They can last for life with good oral hygiene. At our Milton Keynes dental practice, we believe investing in your smile is one of the best decisions you can make. This entry was posted in Blog on 30th December, 2015 by Northlight Dental. New Treatment Room Up and Running! Welcome to our new blog page. We hope you will enjoy reading our monthly blogs which will keep you updated with news from the practice and also provide useful information regarding all things dental and oral health related. As some of you may already be aware, we have recently been having some building work at the practice. We are very pleased to let you all know that after a month of noise and mess, the project is fully complete and we now have a brand new, state of the art second surgery. The expansion has also allowed us to build a new large decontamination room and consultation area. As part of our upgrade, new computers have been installed and have been updated with the latest dental and office software, as well as a new digital telephone system which gives us an additional phone line into the practice. What does this mean for you, our patients? Having another surgery means that more surgery time is available. This allows us to offer you more appointment dates and times, including evenings and Saturdays, to help fit in with your busy schedule. 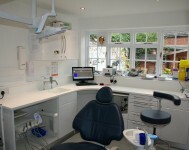 Sunil will be available every day of the week and you will be able to see all our specialist dentists more quickly. 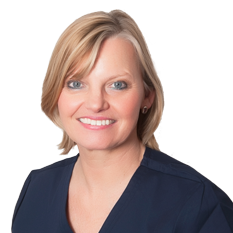 You can also have the convenience of having your hygienist and check-up appointments on the same day, as both Alison and Sunil will now be working some of their sessions at the same time. Our new telephone system provides two telephone lines coming into the practice, this means you will always have your call answered straightaway. Plus our website now allows you to book your appointments on-line. So whether we are open or closed you will still be able to book in, making life that little bit easier. Our brand new state-of-the-art surgery! This entry was posted in Blog on 28th September, 2014 by Northlight Dental.